My original caption: "I know you said you'd be on vacation this week, Doctor, but a serious problem has come up . . . "
Congratulations, Daniel -- you're now officially one of the funniest people around! As a mental exercise, I tried to improve your caption (for instance, I thought maybe it would be better without the first four words) -- but in the end I decided that your instincts were correct, and the caption is perfect as you wrote it. I was intrigued by Sharon's "empty chair technique". Is there such a thing? If not, there certainly should be, and I'll bet some clever psychiatrist is working on it right now. I laughed at Caryn's "Twitter followers", but then read the caption again and realized that it really didn't make too much sense and I was just laughing because "Twitter" is a funny word these days. Other captions in contention: Sharon's "imaginary friends", Levi's "fear of abandonment", Leftie's "shy, but this is going a little too far", and Paul's "virtual reality". Nice work, all of you. This should put Psychiatry back about 50 years. New contest coming up soon. Yes, there is an empty chair technique. The client talks to a person, object, self, part of self, or abstraction imagined to be sitting in the empty chair. The client can also sit in the chair and continue the conversation, now reversing roles. Are you serious, Sharon? I have lots of questions, such as: Who is listening to this conversation? How is the client being helped? Is the session being recorded for future analysis? Etc, etc. I really like your original caption, Eli. Fits wonderfully. 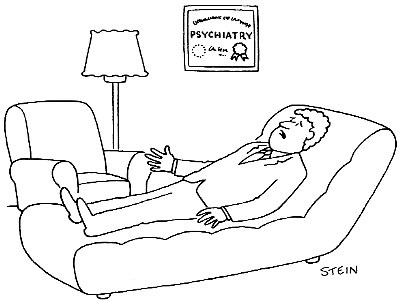 The therapist is there, guiding the intervention. It can be used for self-expression, clarification, help with closure, and all kinds of therapeutic exploration. 1 - Doc, for some reason I feel like I'm talking to myself. 2 - I'd like to get more feedback than I've been getting. 3 - I know these sessions are free of charge, but I don't think I'm getting much out of them.